First Sentence: 3 May. Bistritz – Left Munich at 8.35 p.m. on 1st May, arriving at Vienna early next morning; should have arrived at 6.46, but train was an hour late. Comments: Dracula has long been a character of myth, both in literature and in the movies. 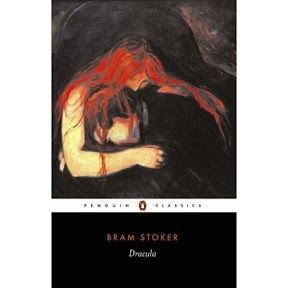 With the continuing and in some ways resurgent popularity of vampires today, I thought it was time I went to the one of the most famous accounts of the infamous vampire, starting with Bram Stoker’s Dracula. I had the added motivation of wanting to read a novel that more recently came out called The Historian by Elizabeth Kostova, and starting off with Dracula seemed the a wise course after seeing reviews of Ms. Kostova’s book. Bram Stoker’s Dracula was subtle in terror, and yet quite suspenseful and alluring all the same. The novel is made up of journal entries, phonograph records, telegrams and missives, all offering the different perspectives of the many characters as the story unfolds. There is the young and courageous Jonathan Harker, his clever and perceptive wife Mina, the gentle and beautiful Lucy, the quiet but strong American Quincey Morris, the wealthy and gentlemanly Arthur Godalming, the intelligent Dr. John Seward, the lunatic Renfield, Professor Van Helsing whose knowledge and skill lead the group on their quest, and, of course, the most famous character of all, Count Dracula, who is most mysterious and horrifying throughout. Their experiences made for an intriguing story, which had me eagerly wanting to return to visit them each time I had to set the book down. As with many classic novels, Dracula has been taken apart, piece by piece, every bit of it analyzed and philosophized about. There are many theories as to the author’s intent and its representation of Victorian society at the times. I did not read Dracula with any of this in mind, nor did I seek it out. I read the novel for purely entertainment value and was well rewarded. It is no wonder the novel has earned the status of a classic, and there is no doubt that it will continue to do so. Favorite Part: I loved the character of Mina right from the start. She was not only intelligent and courageous, but also had a good heart. My favorite portion of the book by far was the beginning sections where Jonathan Harker is in Transylvania visiting the Count. There was eeriness about it that carried over into my dreams that first night after I started reading the novel. Miscellaneous: From the late shift to the early shift. I am not sure how I feel about waking up extra early in the morning to get ready for work, but I don’t mind getting off at an earlier hour, that’s for sure! On the movie front, my husband and I recently enjoyed watching Fried Green Tomatoes, a movie I had seen years ago, but after having just read the book was inspired to do so again. There were quite a few differences between the book and the movie, although that in now way took away from either. I enjoyed them both immensely. We also recently saw The Lake House movie starring Keanu Reeves and Sandra Bullock. Although slow at times and trying to ignore the paradox that often comes with time travel of any kind (this time through letters), we both enjoyed the movie quite a bit.